Michelangelo finished the ceiling of 'The Sistine Chapel' in 1512. Initially Michelangelo was skeptical about accepting the commission, believing he was primarily a sculptor he was suspicious about whose idea it was that he took the work. 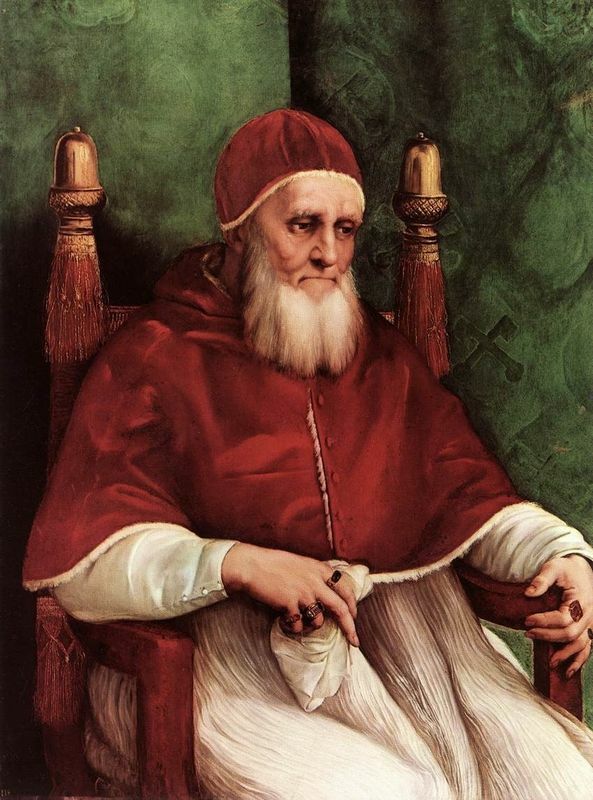 However with some persuasion and pressure from Pope Julius II he undertook the job. Although Pope Julius II originally asked Michelangelo to paint only 12 large figures of the Apostles onto the ceiling, the artist had other ideas. He proceeded to convince the pope that a grander scheme would be better and went on to paint over 300 figures onto the ceiling of 'The Sistine Chapel'. Today it is viewed as one of the greatest examples of Renaissance Fresco painting that exists. 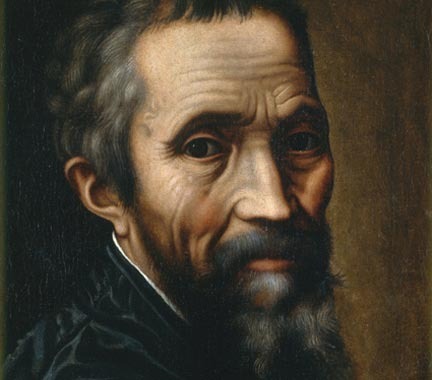 A talented and popular man Michelangelo was nevertheless antagonistic toward the other artists in Rome, Italy. He was constantly paranoid they were trying to sabotage his reputation and was known to be a hostile individual. Consequently when Pope Julius II asked Michelangelo to paint Frescos onto the ceiling of 'The Sistine Chapel' Michelangelo did not believe that it was an innocent commission. Considering himself to be a sculptor rather than painter he thought that it was an attempt by a fellow artist to harm his good standing. Michelangelo was convinced that the architect Bramante, whose work he had previously corrected, had convinced Pope Julius II to offer the work to Michelangelo so that he would fail and ruin his reputation as an artist. However Pope Julius II was positive that he wanted Michelangelo to take the commission for The Sistine Chapel and decided to place some pressure on the artist. With the promise that Michelangelo would be able to complete the Pope's tomb (an incomplete commission Michelangelo was keen to progress with) if he finished The Sistine Chapel the artist was persuaded to undertake the work. Nevertheless despite Michelangelo's beginning hesitation about taking the job he dove into it enthusiastically and painted much more than Pope Julius II had originally intended. Although Pope Julius II initially asked Michelangelo to paint the 12 Apostles prosperous and wearing expensive clothing Michelangelo disagreed. Arguing that the Apostles had always been poor Michelangelo's version of the story says that Pope Julius II then gave him free reign to paint whatever he desired onto the ceiling of The Sistine Chapel. However the idea of Michelangelo having the freedom to paint whatever he wished onto the ceiling is challenged by many art historians. The Sistine Chapel has always been one of the most important locations in the Catholic religion and according to many it is unlikely Michelangelo, who was not versed in Latin, painted the ceiling with no input from the pope. According to many art historians it is likely that Pope Julius II's cousin Cardinal Marco Vigerio della Rovere advised the two men on how they should proceed with the ceiling of The Sistine Chapel. Although the Chapel was considered by some to be already complete, the Pope's complex desires saw Michelangelo radically changing the interior of the room. Nevertheless who was in control of the design of the Fresco on the ceiling of the Sistine Chapel will forever be a mystery. To understand the Sistine Chapel correctly the viewer has to begin at the entrance of the chapel and move toward the altar, looking at the scene as it progresses. The story begins with Noah and the ark near to the entrance, and at the altar it ends with the separation of light from darkness, reversing the story of genesis. 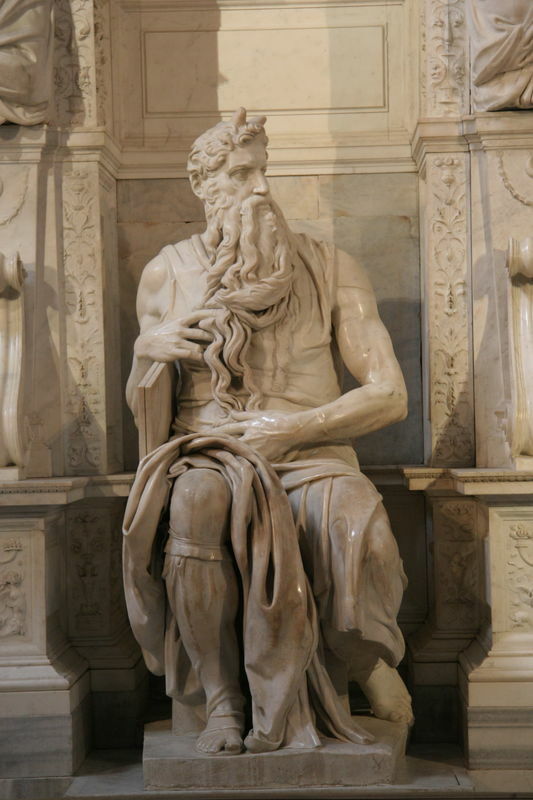 Why Michelangelo or Pope Julius II chose these particular biblical scenes in this order has been frequently discussed by different art historians, and will likely remain unknown. There was clearly a reason that the usual scene was reversed but the meaning can only ever be speculated upon. Nevertheless the image of God giving life to Adam though his finger tips has been used and parodied numerous times. Consequently it is one of the most famous images of all time. 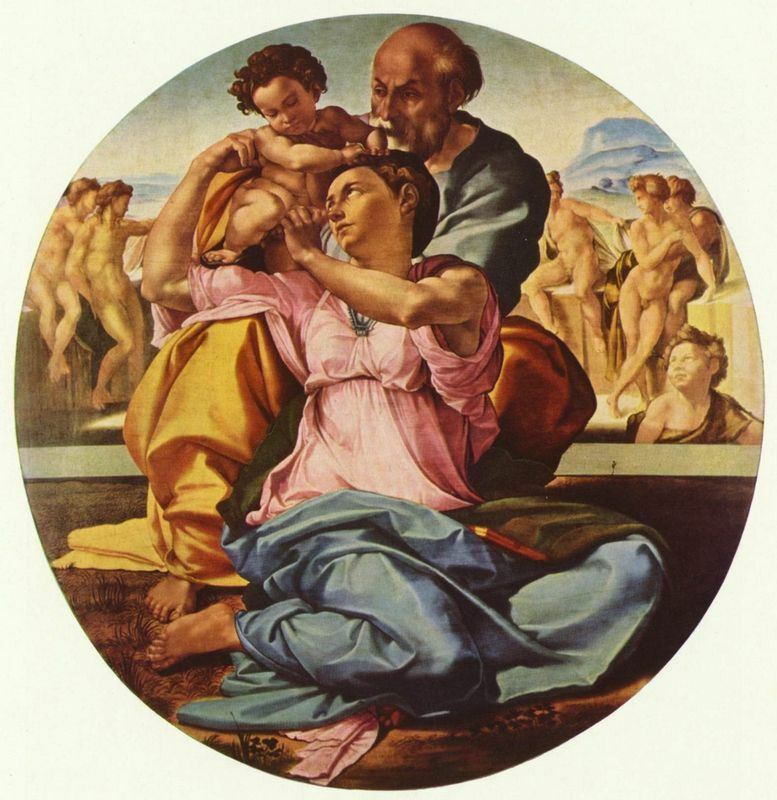 Michelangelo fervently began his work in 1508. He started making all of his original drawings, planning out his use of space, before beginning to create the cartoons. He nailed the cartoons against the wet intonaco (the final wet layer of plaster before a fresco is painted) and transferred the pictures onto the ceiling. He then painted the Frescos onto the roof from his specially designed scaffolding. He worked in an upright position, from a platform that curved at the same angle as the ceiling. However after only four months of painting onto the intonaco there was already a problem with the Frescoes. The work became moldy incredibly quickly and all of Michelangelo's work had to be scraped off before being started again. Consequently Michelangelo was forced to begin again, painting the scenes of Noah and the ark before moving onto the prophet Isaiah onto new plaster, which had been made with a formula that was less likely to go moldy. It was after this that Michelangelo removed his scaffold for the first time in order to view his creation from a distance. It is worth noting that post this the scale of everything he painted became much larger. Michelangelo clearly decided with perspective that the piece needed to be much larger and grander. This was not the first time that this occurred and there were other times when Michelangelo increased the scale of his work after removing the scaffolding. The ceiling of 'The Sistine Chapel' was eventually finished in 1512 after over 300 images had been painted onto the ceiling by Michelangelo. The artist complained that after years of standing at an uncomfortable angle he was left suffering from many health issues. Although he did have assistants he was famous for completing the majority of the work by himself. Nevertheless many today would say that the pain was worth the result. The images that are painted onto the ceiling of 'The Sistine Chapel' are viewed by millions of viewers every year. After Michelangelo died there have been many attempts to clean the ceiling of The Sistine Chapel. Damage caused by water leaking in left some of the Frescoes in poor shape. Consequently in 1625 Simone Lagi undertook a restoration. He rubbed wet bread over the paint and reported that Michelangelo's Frescoes were left as he had originally intended them to be. 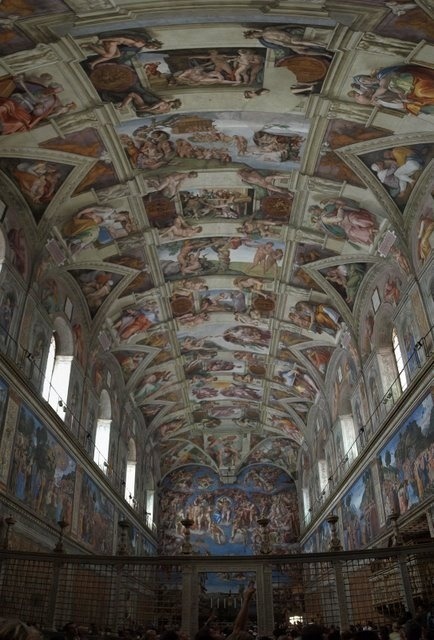 However there were rumors that he resorted to using glue varnish to brighten the ceiling of The Sistine Chapel. There were other restoration projects completed in the eighteenth century and the early twentieth century. The most recent restoration to the Sistine Chapel ceiling occurred in the late nineteenth century. The restorers cleaned the ceiling of the Sistine Chapel and removed the vast quantities of dust and smoke that had gathered on the paint. Although it had some critics who said that Michelangelo had intended for the painting to be dark, the restoration was hailed as a success by the majority of art historians. Today the ceiling of the Sistine Chapel is considered one of the greatest examples of Renaissance fresco painting that exists.